Amanda's Parties To Go: Let's Get it Started..... HALLOWEEN! Whooo-hoooo! It's October! Oh yeah! Oh yeah! If you love Halloween as much as I do, you are going to LOVE all of the amazing ideas and fun projects I'm sharing with you this month. I've decided to do a series of Halloween features showcasing lots and lots of tricks and treats and maybe a Monster Bash or two. So stay tuned for some really great inspiration -- your kids will love you for it!! Today I wanted to tell you about a wonderful new bakery I came across last night. 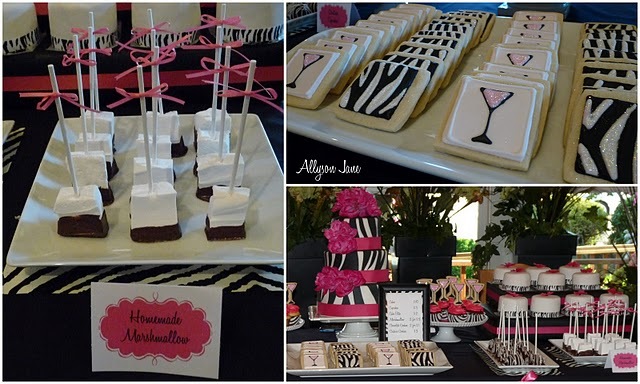 Allison Jane, formerly of Girly Gatherings, has decided to venture out on her own and open a bakery full of amazingly decadent desserts. To get the word out and celebrate, Allison is offering 2 dozen of her FABULOUSLY decorated Halloween cookies (plus FREE shipping!) in a contest on her blog and her Facebook page. Just click the links, follow a few requests (such as becoming a fan on her Facebook page) and you will be entered to win these YUMMY cookies!! 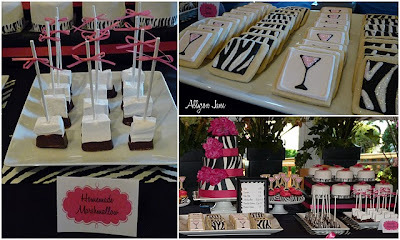 Look at these zebra cookies -- and the martini glass, how cute is that?? One of my favorites -- the monsters! I've been dying to design a Monster Bash!! Good luck! And may the best entry win!! And while your on Facebook, become a FAN of Shindig, too! We'd love to see you there! Thanks for posting about my new bakery and giveaway on your blog! Good luck to the winner!